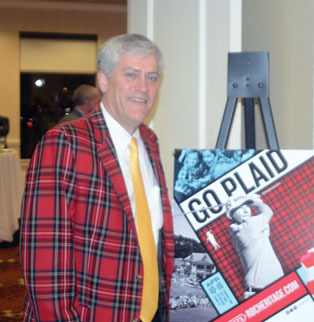 Spartanburg attorney Doug Smith is serving as the Chairman of the RBC Heritage. The RBC Heritage presented by Boeing is off to a great start for the 2017 tournament at the Harbour Town Golf Club. The weather has been very cooperative, the field is strong, the course is in great condition and the leadership is in good hands. Spartanburg attorney Doug Smith is the chairman of the tournament this year. He is the first person to come from the Upstate to be the chairman of the 49 year old PGA Tour event. 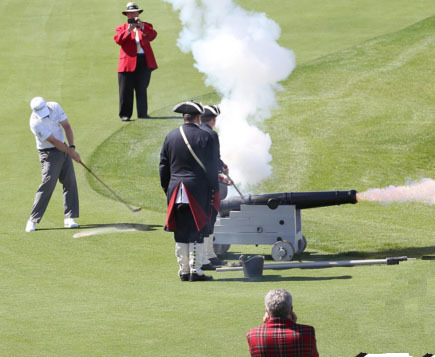 One of the honors that goes to the chairman is leading the parade to the 18th green to fire the ceremonial cannons and start the weeks activities. “It really was quite an honor. I had to look around a couple of times and make sure everyone was still following me,” Smith joked. He also learned a valuable lesson at the opening ceremony about the 18th century cannons. Defending champion Brandon Grace hits the ceremonial first tee shot as the cannon fires. In the bottom of the frame is Chairman Smith covering his earns. “I was standing too close to the first cannon that was fired and it shook me up. When it came time for the second cannon shot, I got as far away from the big gun as I could,” he said. The one time South Carolina legislative leader is an accomplished golfer himself. Being around all the great players on the PGA Tour has been an extra benefit for the chairman himself. “You know you see these guys and the way they take it back and you say to yourself, I can do that, but you really can’t. 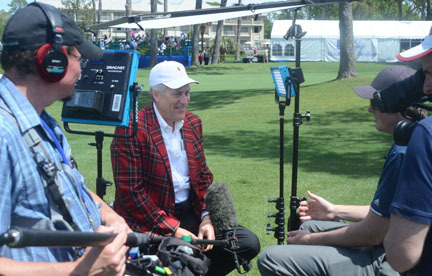 They are such great players and the golf here is always excellent,” said the chairman. The former president of the South Carolina Golf Association’s first love in the game is helping to build junior golf. South Carolina has a well earned reputation for outstanding junior golf as does Smith. The Heritage chairman was one of the founding members of the now 23 year old Bobby Chapman Junior championship in Spartanburg. The Heritage chairman is also the Chairman of the Bobby Chapman Junior. Here Smith presents the championship award to Davis Shore, who has been ranked as the top junior in the country. 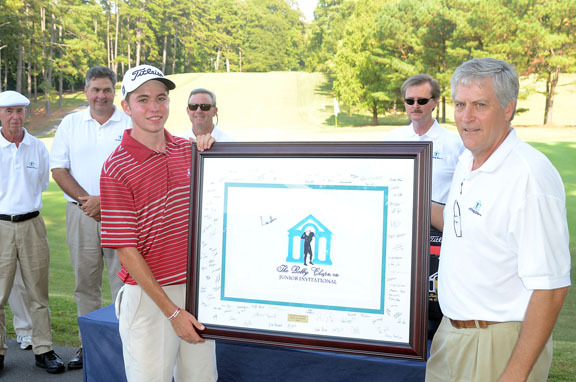 The tournament is one of the most prestigious junior boys events in the country. Juniors who have played in the event and are now on the PGA Tour include World #1 Dustin Johnson, Lucas Glover, Bill Haas, Bubba Watson and many more. ” Its great to see that they made it to their goal and I’m glad the work so many people do to support junior golf in the state pays off for the top players and also for golfers who just play for fun,” Smith said. The Chairman’s final duty is to help in the presentation of the Tartan Jacket. It is not as famous as the Green Jacket given to the Masters winner, but the Heritage’s winners jacket is a lot more colorful. The Chairman has done dozens of interviews to promote the Heritage and the charities and public service organizations they help. “You know Arnold Palmer, Jack Nicklaus, Tom Watson, Greg Norman, Fuzzy Zoeller and Davis Love, III have won this tournament and we have another great field this year. I’m looking forward to honoring a champion on Sunday,” he concluded.